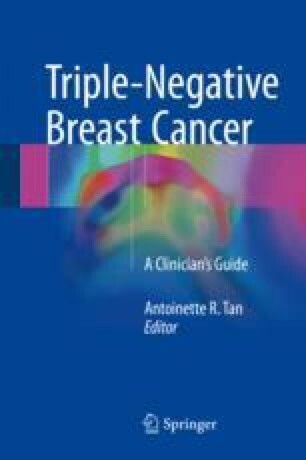 Triple-negative breast cancer (TNBC) accounts for only 15–20% of invasive breast cancers overall, but it generates substantial research and clinical attention because of its inherently aggressive nature biologically. The disproportionate contribution of this phenotype to breast cancer morbidity and mortality generates questions regarding optimal surgical management of the breast and axilla. This chapter will review the existing data confirming the safety of breast-conserving therapy (lumpectomy and radiation), immediate reconstruction, and lymphatic mapping/sentinel lymph node biopsy for patients diagnosed with TNBC. Finally, the potential benefits of neoadjuvant chemotherapy for TNBC will be summarized, including the prospects for improving breast-conserving therapy and reducing likelihood of the patient undergoing axillary lymph node dissection. National Comprehensive Cancer Network Version 1.2017, 03/10/17 at https://www.nccn.org/professionals/physician_gls/pdf/breast.pdf. Last accessed 29 March 2017. Alliance 11202-comparison of axillary lymph node dissection with axillary radiation for patients with node-positive breast cancer treated with chemotherapy. https://clinicaltrials.gov/ct2/show/NCT01901094. Last accessed 30 May 2017.